Presented to a woman in our community who demonstrates excellence, creativity, and initiative in her business or profession. Provides valuable services by contributing time and energy to improve the quality of life for others in the community. Actively assists women in realizing their full leadership potential. This award is presented to an individual or business, in good standing with the Chamber, that significantly impacts the health and wellness of their employees and/or the residents of Johnson County by their efforts and initiatives. Marzie Bartee is a women who has been a vital part of the community by participating, volunteering, and working quietly behind the scenes whenever she saw a need. This award recognizes a citizen of Burleson who has contributed to the community in an outstanding way personally, through the Burleson Area Chamber of Commerce or another service organization over the past year. 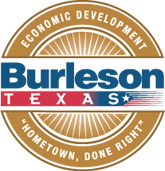 The recipient of this award is a civic organization or non-profit that provides a valuable service by devoting time and energy to improving the quality of life for those in the Burleson area. This may be an organization that provides financial, emotional, and/or spiritual support to the citizens of our community. In keeping our mission to promote local business, the Burleson Chamber is proud to recognize members who represent innovation, entrepreneurship, and the best business practices through the BACC STAR Small Business of the Year Awards.